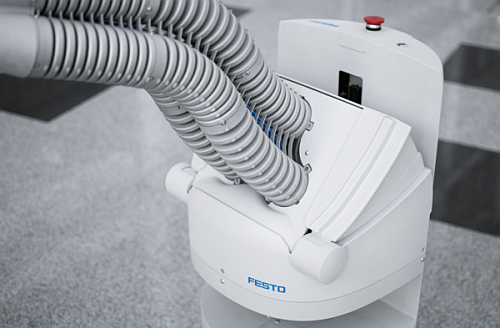 With the technology study Robotino® XXT, Festo Automation and Festo Didactic present for the first time a mobile manipulator that is capable of operating both in the industrial and the domestic sphere. The basis for Robotino® XXT is the newest generation of the mobile robotics platform Robotino®, which has been available since 2006 and has significantly improved concerning its load-bearing capacity, expandability and computing power. Robotino® XXT is equipped with a complete Bionic Handling Assistant as well as the necessary equipment for air preparation and control of the manipulator. The height of the Bionic Handling Assistant can also be adjusted using an electric linear axis with a tilting device. These two additional degrees of freedom expand the working space significantly: Robotino® XXT can pick up objects and put them on a shelf, for example. In combination with a bendable bellows structure and an adaptive gripper, Robotino® XXT fulfils the requirements for the use as a safe and mobile manipulator. To meet the requirements of the mobile robotics of the future, a new level of autonomy, safety, communication and adaptive systems for various applications is needed. Standardized hardware and software components additionally support various potential scenarios of mobile robotics to be realized economically. Robotino® XXT serves as a research platform for engineers and computer scientists worldwide, who can use it to develop new methods and tools for the service robots and production assistants of the future.